I can’t resist gray v-neck t-shirts, tasty Bavarian brews, and Poppy-colored nail polish. 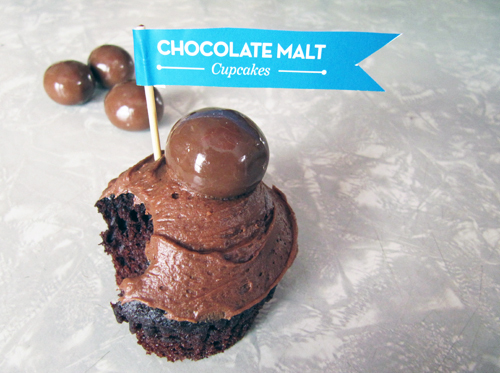 I can’t resist ankle boots, Ben & Jerry’s Half-Baked ice cream, and I really can’t resist these chocolate malt cupcakes. Did you know that malt powder is a magic ingredient? 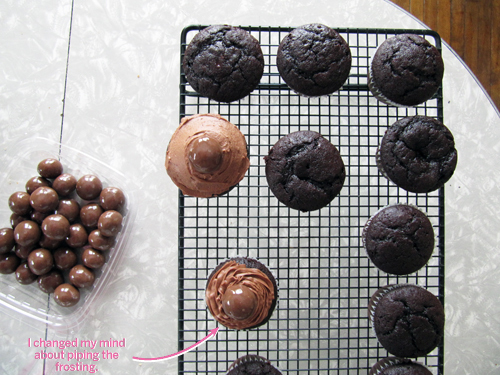 It makes waffles even better and it sure makes chocolate cupcakes irresistible. I made these for a birthday party. I topped them with little flags so if I wasn’t around people would know what they were getting into. 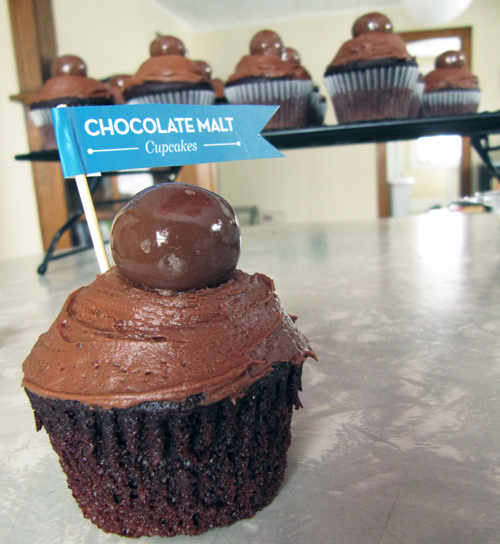 The malt balls are super tasty on top too. You could always crunch them up to top the cupcakes. That’d be super pretty. Would you like to top your cupcakes with snazzy flags? Download the template and print it out! Then just cut them out, fold the left edge over an 1/8th of an inch, and glue a toothpick in the fold. 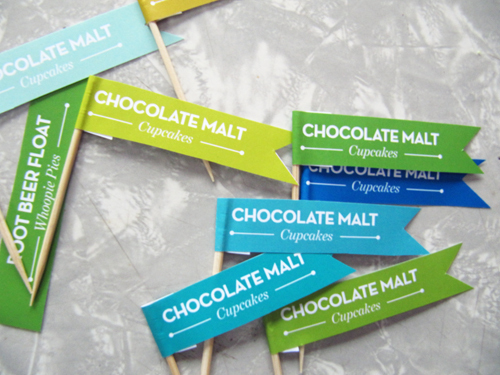 Download the flag template right here: Chocolate Malt Cupcake Flags. P.S. Do you see the clue about what the next post is going to be?! I made 2 soda fountain-inspired baked goods for this birthday party. preheat oven to 350°F. Line standard muffin tins with paper liners. Whisk together flour, cocoa, both sugars, baking soda, and salt. In another bowl, whisk together milk and malted milk powder until powder is dissolved. With an electric mixer on medium-high speed, beat flour mixture, milk mixture, and oil until combined. Add egg and then egg white beating until each is incorporated, scraping the sides of the bowl as needed. Add sour cream and vanilla, beat just until combined. Divide batter evenly among lined cups, filling each halfway. Bake, rotating tins halfway through, until cake tester inserted in the centers comes out clean, about 20 minutes. Allow to cool completely before frosting. I just want to surf on that frosting wave. * The salt in this frosting is what makes it the best frosting ever! In a small bowl, whisk together the milk and malted milk powder. Set aside. Using an electric mixer cream together the butter, cocoa powder, and salt. It’ll be super thick. Turn off the mixer and scrape the sides of the bowl. Add 2 cups powdered sugar. Turn the mixer on low and drizzle in 1/4 cup of the milk mixture and vanilla. Turn mixer to medium and add as much more of the milk mixture until you’ve reached your desired consistency. Feel free to add more powdered sugar and then add more of the milk mixture until the frosting is thick and fluffy. You might not use all the milk mixture. 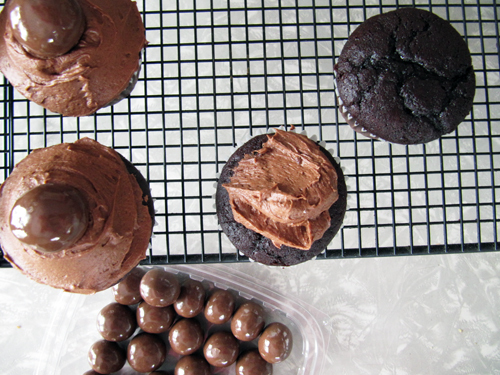 Spread onto cupcakes using an offset spatula. Top with a malted milk ball and a flag. 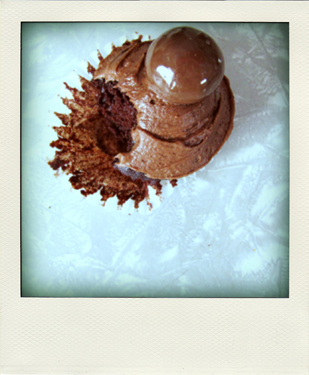 I took a megabite out of this dreamy cupcake. Big deal. When you come to MN, would you come to my house and bake these for your Uncle? He’d love it if they came from you. Of course so would I since I tend to be baking challenged. malt powder is the best! i just purchased a new nail color called “mint candy apple” it’s so pretty! the cupcakes look great and i love the flags! I agree! Oooh, I bet that nail polish is amazing. first of all, i love the message in the eggs you bought! second of all, those flags are so cute! I just printed this same recipe from another web site a couple days ago! YUM! Love your site Meg, I stalk it often. Tell your family I said HI!